Ross & Cromarty Roots | Kilchrist Churchyard. Kilchrist (sometimes Gilchrist) Churchyard sits in the countryside SE of Muir of Ord, accessing via a farm road off the B9169. 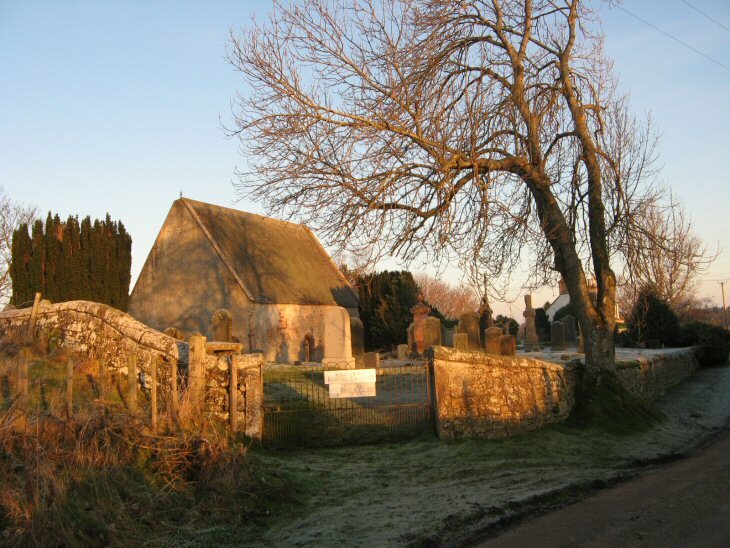 Now within Urray Parish, this is a medieval religious site, which formerly contained the Kilchrist Parish Church. The main building was converted to a mausoleum for the Gillanders of Highfield and the Mackenzies of Ord (no access) in the 19thC (see Image No. 15640). Picture Added on 27 December 2008.
we believe my Great Great Grandfather, Great Great Grandmother and Great Grandmother are buried in this cemetry. Donald & Helen Campbell and Margaret Campbell. We visited this cemetry in 2003 but could not find any gravestones.Could you help us. We hope to visit in 2011. Added by William Sugars on 19 June 2009. I hope to survey here later this year and shall look out for these names. Added by Roddie on 20 June 2009. I am searching for the grave of John Gillanders of Tollie who died 1st August 1787, father of Rachel Gillanders and suspect he may be in this site. Also Alexander Gillanders, a tenant of Kildun in 1807. Added by Rosemary on 20 July 2009. The McLennan, Fraser, McKay names are all in my ancestor line. I have not investigated the cemetery records yet. Added by Marilyn Cameron Stinson on 25 September 2009. Added by Robert Russell on 19 October 2009. Alexander Campbell dob.1809 Urray, Ross-shire, death 25.03.1881 Urray is he buried here. Added by Campbell on 19 March 2010. Re Alexander Campbell. There is no evidence that he is buried here. Added by Roddie Macpherson on 19 March 2010. Added by S Jones on 22 May 2016. I hope that William Sugars found the Campbell headstones if he was there in 2011. Because they are there and I and others have photos of them. I just found your website today so will try to contact Mr. Sugars as Donald and Helen Campbell were my ggp's too. Their eldest son, also named Donald Campbell, moved to Dundee and is buried there. Added by Valerie Campbell Ackroyd on 16 June 2016. I think my ancestor John Chisholm was buried at Gilchrist in 1856 and his wife Christy macrae in 1862. Added by Lesley Dosen on 19 April 2017.